We hire skips to the general public as well as the commercial industry. We deliver and collect Monday to Saturday and if you need a skip for a longer period of time, we can arrange for regular collections. If you prefer, you can call us when you need the container emptying. 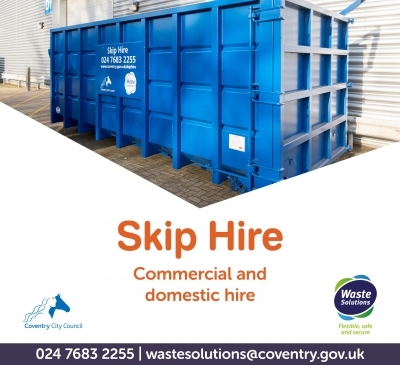 Skips can accept all types of waste except those classed as dangerous or hazardous including asbestos, plasterboard, fridges, liquid wastes, monitors and tyres. The skips can accept all types of waste apart from materials classed as dangerous or hazardous. These include asbestos, plasterboard, tyres, monitors, televisions, fridges and liquid wastes (oils and paints). Feel free to call us, if you are in doubt. The skips that we supply for domestic use has a capacity of 6 cyds and when filled with rubble or soil is likely to weigh 6 to 8 tonnes. Be warned - a fully loaded skip on the vehicle could weigh around 18 tonnes and may not be suitable for your drive. Where can I put the skip? Do I need a licence? You can place your skip on your own property without a licence. But you will need a licence for the skip if it is placed on roads, grass verges or adopted highways. All our hire costs include delivery and collection and all necessary legislation. An extra charge is made if the skip is to be placed on the highway, which includes road licence fee and lighting. The cost of licence depends on how soon before the booking you tell us that the skip needs to go on the road and you will be told when you book. Request skip hire using our online form and we will contact you within two working days.